A complete brand identity for a new restaurant from legendary butcher Dario Cecchini. For Dario Cecchini’s first restaurant, sbe needed a unique brand identity that articulated its founder’s singular worldview. DK worked closely with sbe to craft a look and feel that honored the legacy, the poetry, and the passion of the ancient art of butchery. A secret society of butchers. Carna is the Roman goddess of flesh. Inspired by the ancient origins of the name, we envisioned the Società Macellaio, a secret society of butchers that have been there through the ages, passing the secrets of butchery and meat preparation down from one generation to the next. Telling the story through symbols. Every secret society worth its salt needs a secret language. We developed an iconic language with four main symbols to represent the circle of life, showing our respect for the animals and the nourishment they provide. 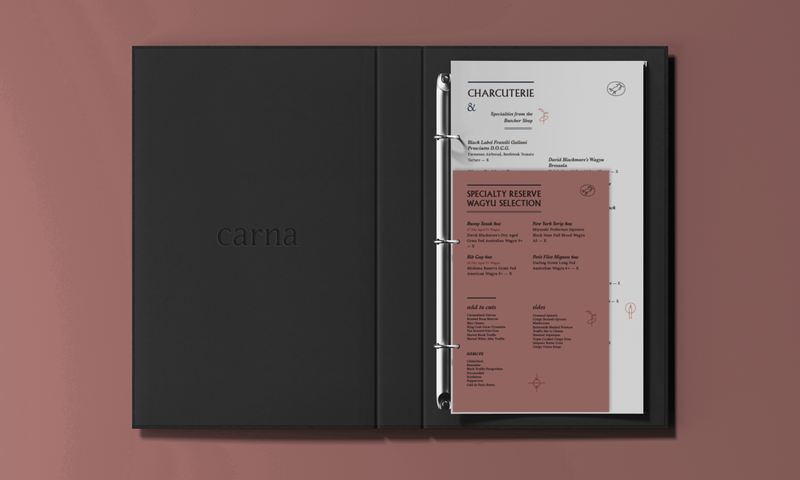 Additional supporting symbols are used ambiguously across a variety of branded collateral to sew intrigue and mystery into the story of Carna. Building cohesion across the brand. From these foundational elements, we developed a complete brand look and feel that was infused into all elements, including table settings, packaging, menus, uniforms, interior design, and marketing materials. We developed a complete brand book to guide use of logo, photography, and other design elements, ensuring consistency across the brand.